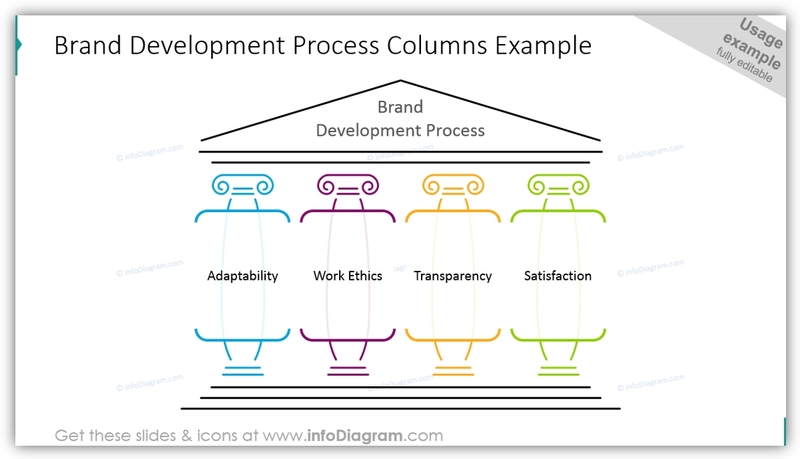 Using pillar or so-called column visuals helps to express business concepts such as company strategy and values that are based on building something on a solid foundation and principles. 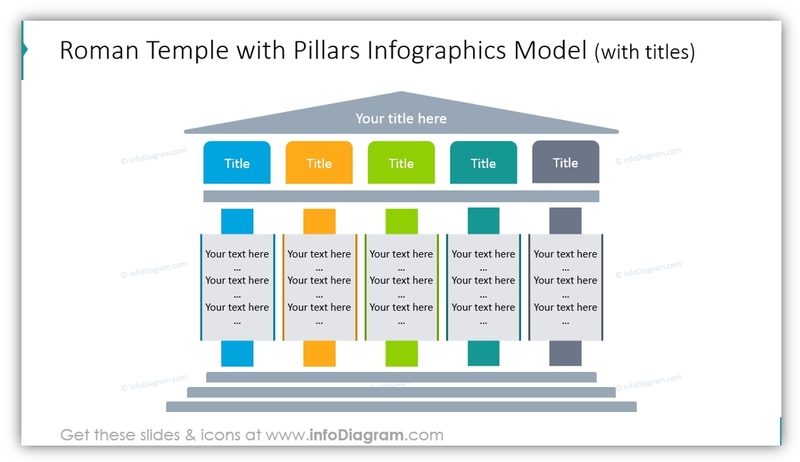 Adding a slide with pillars chart rather than using only a text bullet points will help you to present your idea in a clear visual way . 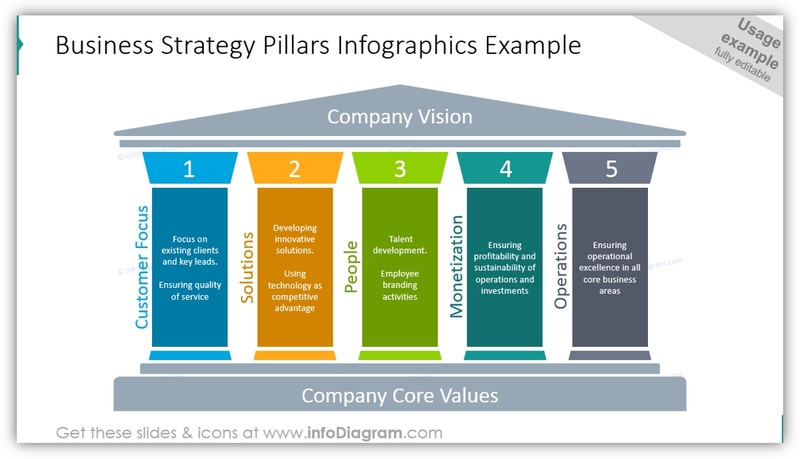 Check below several examples we created of pillar diagram design. 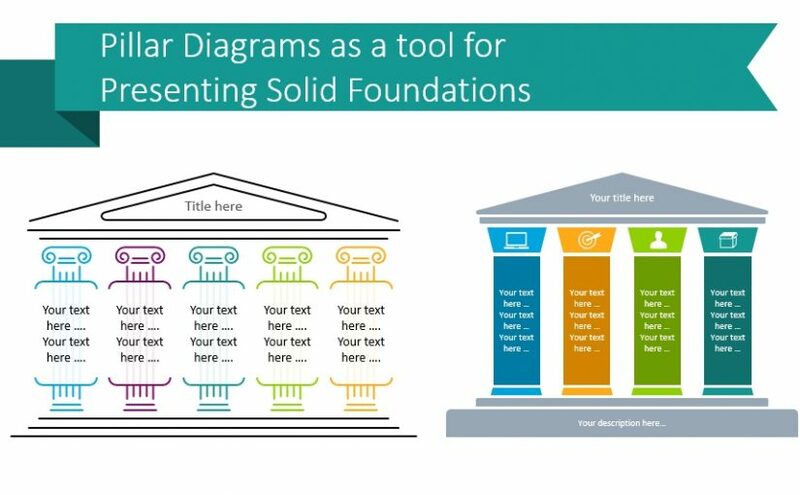 What are the Pillar diagrams? A visual framework representing a solid common ground and supporting principles in form of vertical columns standing on common foundations supporting the roof – a symbol of joint goal or objective. 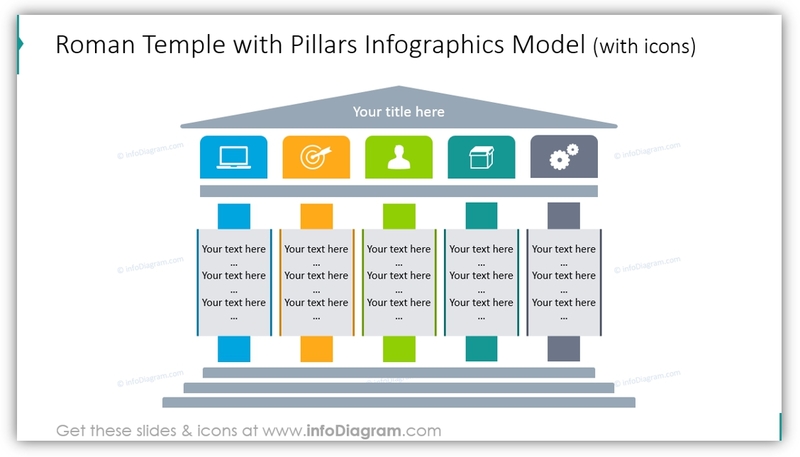 Source note: All slide examples here are based on infoDiagram’s Pillar Diagrams and Column Infographics. Such a minimalistic diagram style will suit any presentation. Outline style is a rising graphical trend, and it will make your slides look stylish and simple at the same time. Flat is suitable for any presentation style. 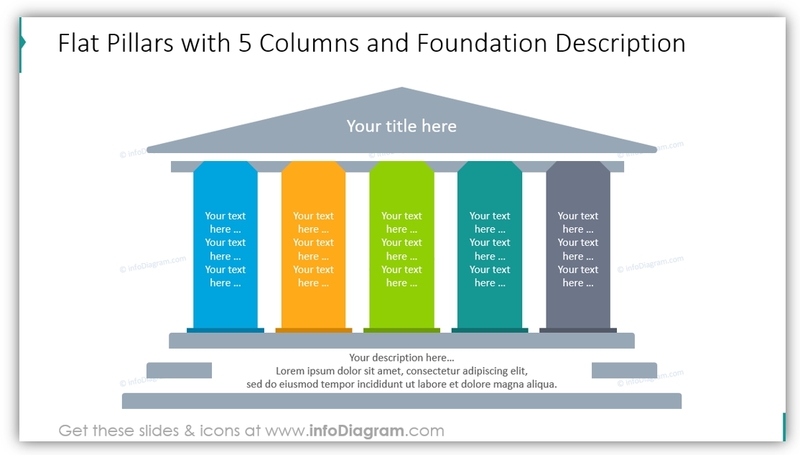 We colored pillars in different colors and illustrated each with an icon so that you can avoid additional texts, as symbols are a universal language. If you need to put more details in the bottom part of the pillar graphics, here’s a template for that: five flat pillars of various color placed on the staircase basement where you can place all texts needed. 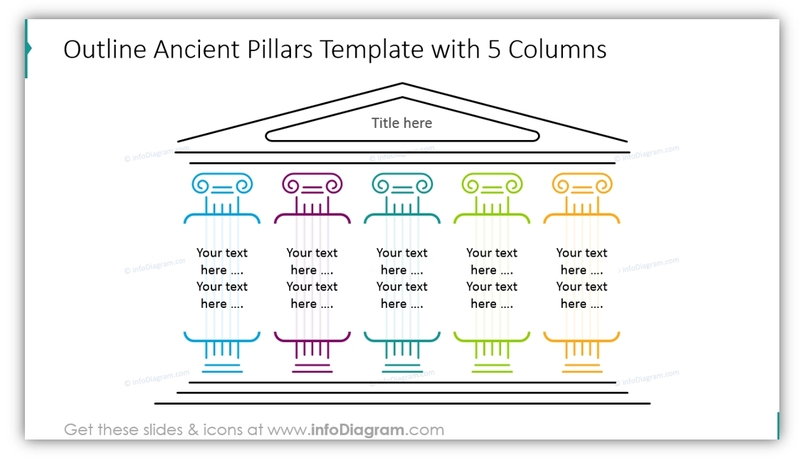 On the other side, if you want to focus on pillars and put more text on them, you can use the diagram template below with pillar header icons to illustrate each column. What do you think about proposed slide graphics? With a bit of creativity and some design rules, it’s possible to make a structure resembling the concept of roman pillars. Having such pillar graphics made of vector shapes, you can easily add or remove columns to fit the number you need. are all pillars equally distributed? Are all elements centrally aligned? aren’t they stuck together? There should be a wide enough gap between them. top triangle should be not too think. The text inside the pillars diagrams should have enough margins from the textbox edge. 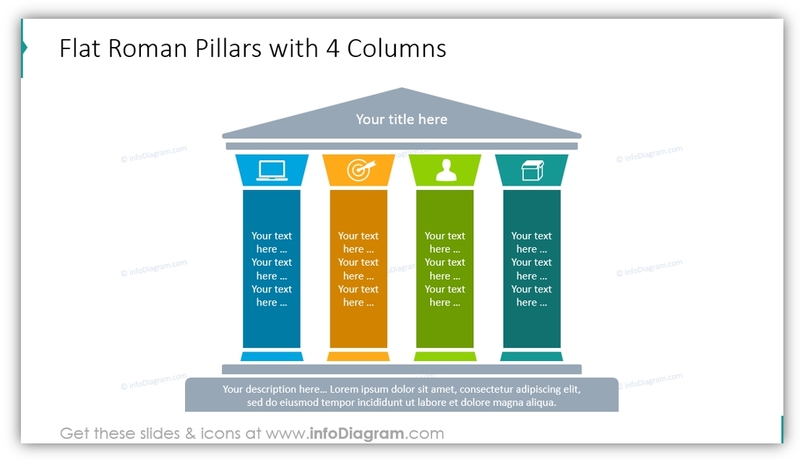 We hope you found some inspiration for creating pillar diagrams in our article:) You can recreate the pillars for the slides from our examples or get ready-to-use PPT slides. If you like the designs above, you can get the package we created (or subscribe and get slides every month for your needs). Should you need any assistance with choosing or using the PowerPoint graphics, let us know here. We will gladly help.